Pierre-Hugues Herbert and Nicolas Mahut of France, background, celebrate after beating Filip Krajinovic and Nenad Zimonjic of Serbia during their double Davis Cup semi final match at the Pierre Mauroy stadium in Lille, northern France, Saturday, Sept. 16, 2017. Two-time Grand Slam champions Nicolas Mahut and Pierre-Hugues Herbert beat Filip Krajinovic and Nenad Zimonjic 6-1, 6-2, 7-6 (3) to give France a 2-1 lead over Serbia in the Davis Cup semi-final on Saturday. 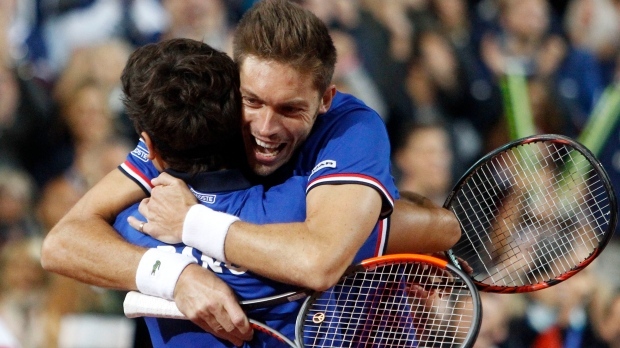 Apart from a scare in the third set when the Serb pair won four games in a row, Mahut and Herbert were in control on the indoor clay court and put France one win away from its 18th Davis Cup final. Friday's singles rubbers had been played on outdoor clay but organizers decided to close the roof at the Pierre Mauroy stadium in the northern city of Lille because of forecasts of bad weather. In Sunday's first reverse singles, Jo-Wilfried Tsonga can clinch the tie for France with victory over Dusan Lajovic. If he fails, the tie will be decided in the final reverse singles between Lucas Pouille and Laslo Djere. Belgium and Australia were level at 1-1 in the other semifinal ahead of the doubles match in Brussels.